2018 Volkswagen Atlas vs Toyota Highlander: Did You Say You Wanted Space? The mid-size SUV segment is growing at a fast pace with Volkswagen’s all-new Atlas being one of the latest models to enter the market. As the German automaker’s largest utility vehicle, it has some stiff competition to conquer starting with the Toyota Highlander. The Highlander is one of the more established mid-size, three-row SUVs on the market with the current generation having been introduced in 2014. Both the Atlas and the Highlander give buyers plenty of space, the latest safety features and impressive comfort. They also have options when it comes to engines and noticeable designs which is rare in a segment where many models are hard to distinguish from each other. 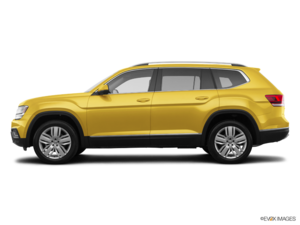 Although both the Volkswagen Atlas and the Toyota Highlander offer a lot to consumers, Volkswagen’s mid-size SUV does stand out in the versatility department while also having a more affordable entry-level version and a more generous warranty. If these are important criteria for you, you may want to check out the Atlas. The new 2018 Volkswagen Atlas features more than 500 litres of cargo space when all three rows of seats are in place. Overall, it has nearly 200 litres more space with all seats up than the Highlander which makes a big difference if you need to use all three rows but still want room for your passengers’ bags. The Atlas is almost minivan-like in that area and certainly, among the most spacious mid-size SUVs you can buy. The Highlander, on the other hand, is about average in its segment when it comes to space. The other noteworthy area where the Atlas stands out is the space offered to passengers seated on the third row. Normally, this row is reserved for kids, but in the Volkswagen Atlas adults over 6 feet will find that they have enough head and leg room for long drives. It’s quite remarkable how much space is available at all three rows of the Atlas. Again, the Highlander falls a little short here with two spacious rows, sure, but a third row that’s really only useful for short trips. The new Atlas is available starting at $35,690 in its entry-level, FWD variant. Powered by an efficient 2.0-litre turbocharged engine, this base model is perfect for families who want space and don’t need AWD. It’s also quite impressive when it comes to fuel economy. The Highlander, on the other hand, only comes with a V6, even in FWD versions and it starts at $37,000. The Atlas’ V6 offering develops 276 horsepower which is less than the Highlander’s six-cylinder engine, but the Volkswagen SUV is lighter which means it feels just as fast if not faster than the Toyota. The Atlas being the more modern of the two has a more advanced technology offering that includes Apple CarPlay and Android Auto as well as an available fully digital instrument panel called Virtual Cockpit. The Highlander doesn’t offer Apple CarPlay and Android Auto, and it doesn’t have the Virtual Cockpit. Lastly, the Volkswagen Atlas is covered for a full four years or 80,000 kilometres. The Highlander’s major warranty stops at 3 years or 60,000 kilometres. These are two very good mid-size SUVs, no question. That said, if you value interior space, and getting more bang for your buck, you’ll want to check out the brand-new Atlas today at Turner Volkswagen.